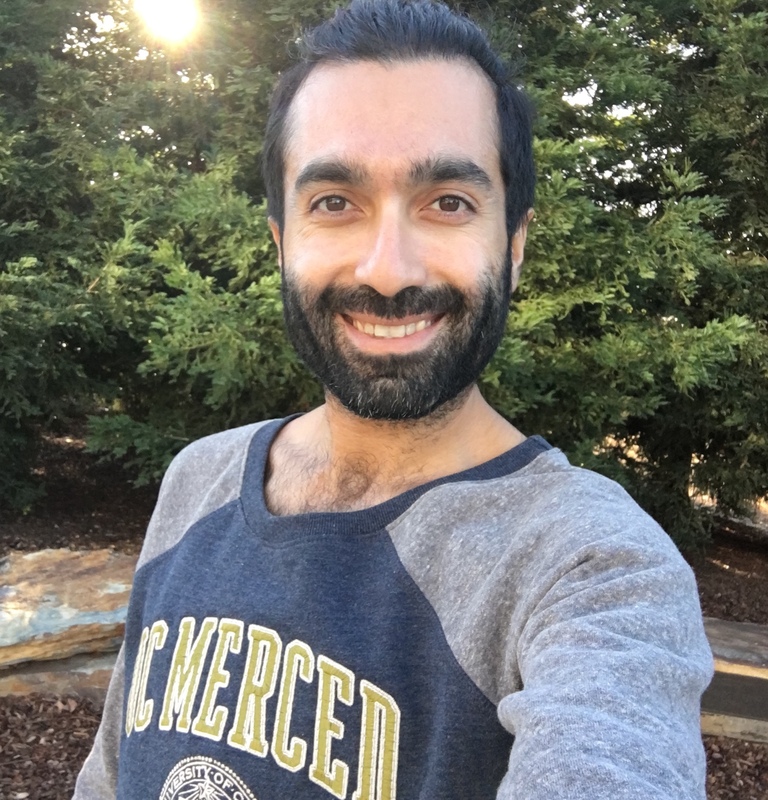 Jacob Rafati is a Ph.D. candidate in the EECS program at the UC Merced. He is also a member of Dr. David C. Noelle's Computational Cognitive Neuroscience Laboratory. His research focus is on Large-scale Numerical Optimization, Machine Learning and Reinforcement Learning. His recent projects involve (1) A Ph.D. dissertation on "Learning Representations in Reinforcement Learning", under the supervision of Dr. David C. Noelle. (2) A collaborative project with Dr. Roummel F. Marcia on "Quasi-Newton optimization methods for large-scale machine learning problems". In his Ph.D. dissertation, he has investigated, and implemented biologically inspired methods for learning representations in model-free reinforcement learning framework. He has also studied optimization methods for large-scale machine learning problems, such as deep learning and deep reinforcement learning. Jacob Rafati, David C. Noelle. (2019). Unsupervised Subgoal Discovery Method for Learning Hierarchical Representations. In 7th International Conference on Learning Representations, ICLR 2019 Workshop on "Structure & Priors in Reinforcement Learning", New Orleans, LA, USA. Jacob Rafati, David C. Noelle. (2019). Unsupervised Methods For Subgoal Discovery During Intrinsic Motivation in Model-Free Hierarchical Reinforcement Learning. In 33rd AAAI Conference on Artificial Intelligence (AAAI-19). Workshop on Knowledge Extraction From Games. Honolulu, Hawaii. USA. Jacob Rafati, and David C. Noelle (2019). Learning Representations in Model-Free Hierarchical Reinforcement Learning. In 33rd AAAI Conference on Artificial Intelligence (AAAI-19), Honolulu, Hawaii. Jacob Rafati, and Roummel F. Marcia (2019). Deep Reinforcement Learning via L-BFGS Optimization. arXiv e-print (arXiv:1811.02693). Jacob Rafati, and David C. Noelle (2019). Learning Representations in Model-Free Hierarchical Reinforcement Learning. arXiv e-print (arXiv:1810.10096). Jacob Rafati, and Roummel F. Marcia (2018). Improving L-BFGS Initialization For Trust-Region Methods In Deep Learning. In 17th IEEE International Conference on Machine Learning and Applications (ICMLA 2018), Orlando, Florida. Jacob Rafati, Omar DeGuchy and Roummel F. Marcia (2018). Trust-Region Minimization Algorithm for Training Responses (TRMinATR): The Rise of Machine Learning Techniques. In 26th European Signal Processing Conference, Rome, Italy. Jacob Rafati and David C. Noelle (2017). Sparse Coding of Learned State Representations in Reinforcement Learning. In Cognitive Computational Neuroscience Conference, Newyork City, NY. Jacob Rafati and David C. Noelle (2015). Lateral Inhibition Overcomes Limits of Temporal Difference Learning. In 37th Annual Cognitive Science Society Meeting, Pasadena, CA, USA. Jacob Rafati, Mohsen Asghari and Sachin Goyal (2014). Effects of DNA Encapsulation On Buckling Instability of Carbon Nanotube based on Nonlocal Elasticity Theory. In Proceedings of the ASME 2014 International Design Engineering Technical Conferences and Computers and Information in Engineering Conference (IDETC/CIE 2014), Buffalo, New York, USA. Mohsen Asghari, Jacob Rafati and Reza Naghdabadi (2013). Torsional instability of carbon nano-peapods based on the nonlocal elastic shell theory. Physica E: Low-dimensional Systems and Nanostructures, 47:316-323. Mohsen Asghari, Reza Naghdabadi and Jacob Rafati (2011). Small scale effects on the stability of carbon nano-peapods under radial pressure. Physica E: Low-dimensional Systems and Nanostructures, 43(5):1050-1055. Mohsen Asghari and Jacob Rafati (2010). Variational Principles for the Stability Analysis of Multi-Walled Carbon Nanotubes Based on a Nonlocal Elastic Shell Model. In 10th ASME Biennial Conference on Engineering Systems Design and Analysis, paper no. ESDA2010-24473, pages 591-598. May 2019. I will present our work on "Unsupervised Subgoal Discovery Method for Learning Hierarchical Representations" on Monday, May 6th, 2019 in ICLR 2019 SPiRL workshop at Room R4, Ernest N. Morial Convention Center, New Orleans. For more details, see http://spirl.info/2019/program/. April 2019. I will give a talk on "Quasi-Newton Optimization For Large-scale Machine Learning" on Saturday, April, 27th, 2019 in Southern California Applied Mathematics Symposium (SOCAMS 2019) at the California Institute of Technology. For more details, see http://cmx.caltech.edu/socams/. To read the submitted abstract, click here. April 2019. I will defend my Ph.D. dissertation on Friday, April, 26th, 2019 from 1:00PM to 2:00PM. The defense will be held in Half Dome Conference Room located at the UC Merced Social Science and Management, SSM 317. For more details, see this flyer. March 2019. The paper, "Unsupervised Subgoal Discovery Method for Learning Hierarchical Representations", co-authored with David C. Noelle has been accepted for presentation at the ICLR 2019 Workshop on "Structure & Priors in Reinforcement Learning" (SPiRL). Congratulations David! January 2019. I gave a talk on our paper "Unsupervised Methods For Subgoal Discovery During Intrinsic Motivation in Model-Free Hierarchical Reinforcement Learning", co-authored with David C. Noelle, in AAAI 2019 Workshop on Knowledge Extraction in Games (KEG 2019) in Honolulu, Hawaii. January 2019. I have been awarded the Graduate Dean's Dissertation Fellowship ($11,000) to support writing my Ph.D. dissertation in Spring 2019 Semester. I would like to thank Dean Zatz for the awrad, Dr. David C. Neolle and and Dr. Marcelo Kallmann for the nomination and support. January 2019. The paper, "Learning Representations in Model-Free Hierarchical Reinforcement Learning" co-authored with Dr. David C. Noelle has been selected for poster presentation in 33rd AAAI Conference on Artificial Intelligence (AAAI-19) in Honolulu, Hawaii for Student Abstract and Poster Program. Congratulations David! December 2018. The paper, "Improving L-BFGS Initialization For Trust-Region Methods In Deep Learning" co-authored with Dr. Roummel F. Marcia has been accpeted to the 17th IEEE International Conference on Machine Learning and Applications conference (ICMLA 2018) in Orlando, Florida for oral presentation. Congratulations Roummel! November 2018. I will give a talk in UC Merced EECS Graduate Seminar on November 2nd, 2018 in COB 265 from 12:00 to 1:15 PM. Title: Limited-Memory Quasi-Netwon Optimization Methods in Deep Learning. August 2018. I am officially a Ph.D. Candidate. Dr. Marjorie S. Zatz, the vice provost and Dean of the Graduate Division congratulated me the advancement to the Ph.D. candidacy. June 2018. I passed the qualification examination by defending my Ph.D. dissertation research proposal succesfully. The title of my thesis is "Learning Representation in Reinforcement Learning". The Ph.D. commitee members are Dr. David. C. Noelle, Dr. Roummel F. Marcia, Dr. Shawn Newsam, Dr. Marcelo Kallmann and Dr. Jeffrey Yoshimi. May 2018. The paper, "Trust-Region Minimization Algorithm for Training Responses (TRMinATR): The Rise of Machine Learning Techniques" has been accepted to the 26th European Signal Processing Conference (EUSIPCO 2018), Italy, Rome. Co-authored with Omar DeGuchy and Dr. Roummel F. Marcia. Introduction to Artificial Intelligence (Java), Fall 2017, Fall 2018. Computational Coginitive Neuroscience (Emergent), Spring 2017, Spring 2018. Computer Organization (C and MIPS Assembly), Spring 2016, Summer 2018. Introduction to Computing I (Java), Spring 2015,Fall 2014. Summer 2018. Engineering Programming (Matlab and Fortran), Fall 2013. Finite Element Analysis, (MatLab and ComSol Lab) Spring 2014. Apart from being a Ph.D. candidiate in computer science, reasercher, developer and teaching assistant, I am a serious artist too. The number of art projects in my art resume is more than the number of research projects in my academic resume. I am a performer, painter and installation artist. You can visit my art website at http://jacobrafati.com for more details. I enjoy walking in nature. I love coffee and coffeeshops. I mostly lived in cities, Tabriz, Tehran and San Francisco. I like Poker and mind games. I love adventurous sports such as Bungee jumping. AAAI 2019 travel fund. January 2019.